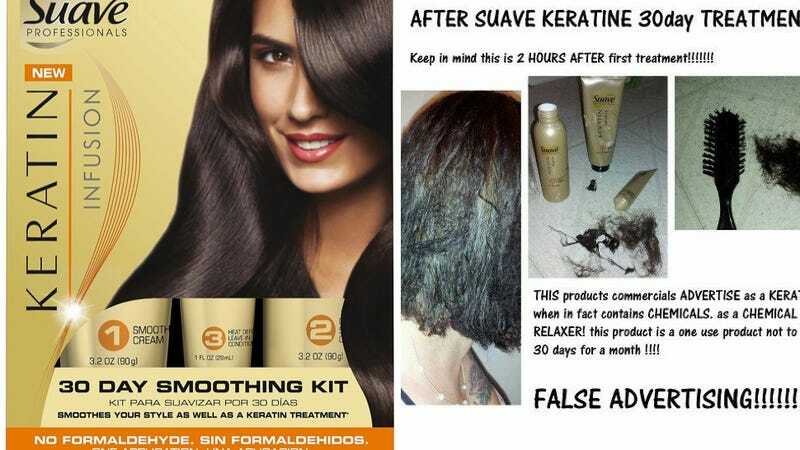 Last year, a group of women filed a class action lawsuit against Unilever, the manufacturer of Suave Professionals Keratin Infusion 30-Day Smoothing Kit, alleging that though the product was marketed at a Keratin smoother, it actually contains a formula to chemically relax the hair. According to the women, this caused everything from melted hair to scalp burns to increased and permanent hair loss and resulted in an aesthetic that would certainly not prompt anyone to GET THIS LOOK! And last week, a judge rejected Unilever's request to dismiss the lawsuit, which means it will be going to trial. ...Unilever may have failed to inform consumers that the Product contains a chemical known as “Tetrasodium EDTA,” which is mainly synthesized from formaldehyde. Unilever also may have failed to inform consumers that the Product contains a chemical preservative known as “DMDM Hydantoin,” which is an antimicrobial formaldehyde releaser with the trade name Glydant. In May of 2012, Unilever recalled the product, but lawyers allege that they didn't do enough to make it clear that it wasn't to be used anymore; one attorney Amy Davis told Austin's Fox affiliate that the recall was "lukewarm," explaining that of the women she represents, 25 to 50 percent of them bought and used the product after it was recalled. Details of the damage documented by some of the women are available on the Facebook page Suave Keratin Infusion Kit Destroyed My Hair. The product is part of a larger Keratin Infusion line of Suave products and is still listed on their website, but noted as "discontinued" with no actual information about why (if you want the dirty details, you have to email or call the company). A link to purchase it on Amazon is dead, though it's still up on Walmart.com – with the note "***TO BE DELETED***." Walmart's site has a massive list of circumstances under which you shouldn't use the product, which include if you have highlighted hair, if you've used henna or if you have ever chemically relaxed or straightened your hair. We see a few of you have questions about the Keratin Infusion 30-Day Smoothing Kit. The kit is a 3-step chemical treatment and is not appropriate for all hair types. We recommend you take the "Is this product right for me?" quiz on our website before using the kit to make sure it’s right for your hair. You also can check out the other products in the line, like the shampoos and conditioners, which provide the smoothing benefits and work for a broader variety of hair types. After proper application of the treatment, Wells noticed her hair breaking at the crown and she experienced significant hair loss at the crown and on the sides of her head. Because of the breakage and hair loss, she has had to cut approximately ten inches off her hair and has spent thousands of dollars on weaves, hair extensions, and other treatments to attempt to restore the damage to her hair. The straightening effects and damage to Wells' hair continues to this day - nearly two years after she used the product. Her once long, beautiful, natural curly healthy hair is now dull, fragile and short. Her hair is extremely thin and the bald spots caused by the treatment are still visible. According to the suit, Unilever also tried to get women who had reported side effects from the product to them to sign a release preventing them from suing the company, in exchange "for as little as $50.00 for a haircut." As the suit goes ahead, the women are asking for damages for "negligence, gross negligence breach of warranty, deceptive advertising, unjust enrichment...and violations of the business and consumer laws."